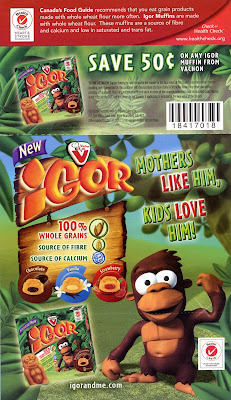 Two days ago Saputo Inc., makers of the obscenely Heart and Stroke Foundation Health Check endorsed chocolate chip muffin and peddled by adorable Igor the Gorilla, pled guilty to 22 charges of targeting children with advertisements. For my non-Quebec readers, Quebec is unique in Canada in that there's this rarely used set of laws established in 1980 that in fact bans advertising aimed at kids younger than 13. Saputo Inc agreed to pay $44,000 in fines. A pittance likely compared to the sales their campaign generated but at least a start. "healthier than other Vachon cakes"
which is kind of like bragging that eating your company's bacon is healthier than consuming pure lard. Similar lawsuits are now moving forward versus McDonald's, Burger King and Lucky Charms maker General Mills. What a shame these laws aren't shared by the rest of our country.